We’d love your help. Let us know what’s wrong with this preview of The Fallen by Jae V. Reece. Follow the harrowing tale of six individuals as they struggle to keep their feet as the whole world crumbles around them. 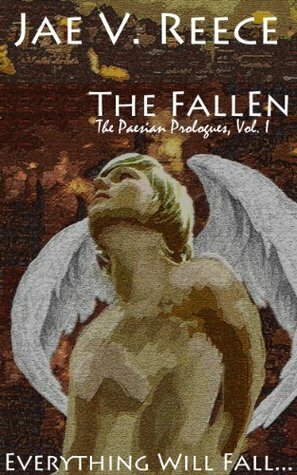 The Fallen is a collection of short stories set in the fantasy world, Paesia and is unlike most other books of it's kind. Fight with the young winged-prince Leiden as he is faced with a barbaric Daemon army that invades his city. Discover the secrets of Follow the harrowing tale of six individuals as they struggle to keep their feet as the whole world crumbles around them. The Fallen is a collection of short stories set in the fantasy world, Paesia and is unlike most other books of it's kind. Discover the secrets of the ice with Oba as he ventures into the ancient ruins above his nomad town to impress a girl. Accompany the elven princess, Phirra, as a benevolent dryad spirit claims that she is chosen to protect the forest from a fiery evil. Flee with Zerale the bard as he tries to outrun the lies and the troubles of his past. Feel Mayomin’s grief as she witnesses her father’s rebellion fall and tries to flee the guards that are trying to make her pay for his crimes. Journey on with Arosad as he travels the dusty crags of Quinn towards an ancient evil that has been unleashed. Full of magic, discovery, betrayal, blood and death, The Fallen is the debut novel from young Australian author Jae V. Reece and it is not to be missed! To ask other readers questions about The Fallen, please sign up. It’s always nice to see young authors releasing their work to the world. The Fallen (The Paesian Prologues) by Jae V. Reece was quite an entertaining read. I am not going to lie. There’s always a sense of doubt whenever a new author makes a debut. However, I felt happy that a seventeen year old was able to write such a story. As the title implies, the story is a set of prologues with very interesting characters. It’s very obvious that the author will be continuing the story later on and the prolo It’s always nice to see young authors releasing their work to the world. The Fallen (The Paesian Prologues) by Jae V. Reece was quite an entertaining read. I am not going to lie. There’s always a sense of doubt whenever a new author makes a debut. However, I felt happy that a seventeen year old was able to write such a story. As the title implies, the story is a set of prologues with very interesting characters. It’s very obvious that the author will be continuing the story later on and the prologues are there to give a taste to readers regarding what they can expect from the series. To me, the story falls under the YA fantasy genre. However, it might not be for readers who want a YA where everything is glossed over. The story talks about war and loss. The author spares no detail when it comes to the harshness of the world and the dire experiences of the characters. The good things about the book: The characters are all separate from each other. It was fun to read how the author was able to give each their own personalities and they belonged to different races and genders. It served as a foreshadowing that the author has thought of a huge world where the story will take place and that’s something a lot of fantasy readers expect. They want a well-developed world. They want different creatures and races in them or else it doesn’t come across as an epic fantasy. Yes, I agree, LOTR has ruined us all! The title is called The Fallen for a reason so you can’t expect a happy ending just yet. Some of the stories end with cliffhangers so, you will have to wait and see when the author decides to continue with the respective storylines. Is the story perfect? No. But that doesn’t mean it’s still not enjoyable. A lot of authors, including myself, learn as they grow. Writing is a talent that only gets better with age and experience. I know for a fact that the author’s writing style will only grow better with age. There’s a lot of description in the story. And that can be a bad or good thing depending on the kind of books you like, and whether or not you prefer a lot of dialogue. The names can get kind of confusing to pronounce, but you know what? It’s a YA fantasy, of course the names are going to be different. The good thing is that they don’t take the reader away from the fun of the story. I was hooked straight away and am mightily impressed by the writing of young debut author, Jae V. Reece. The Fallen is a series of twelve short stories set in the fantasy world of Paesia. In an interesting format, the chapter stories match up 1 and 12 (Leiden), 2 and 11 (Oba), 3 and 10 (Phirra), 4 and 9 (Zerale), 5 and 8 (Mayomin), and 6 and 7 (Arosad). I found this an appealing idea. The story begins with the teenage winged prince, Leiden whose city is under attack by red-skinned daemons. I foun I was hooked straight away and am mightily impressed by the writing of young debut author, Jae V. Reece. The Fallen is a series of twelve short stories set in the fantasy world of Paesia. In an interesting format, the chapter stories match up 1 and 12 (Leiden), 2 and 11 (Oba), 3 and 10 (Phirra), 4 and 9 (Zerale), 5 and 8 (Mayomin), and 6 and 7 (Arosad). I found this an appealing idea. The story begins with the teenage winged prince, Leiden whose city is under attack by red-skinned daemons. I found the young character really engaging and enjoyed the descriptions of his silvery blue hair and feathered wings. There were nice emotional touches with his mother, bringing fleeting gentleness in a battlefield. Another character I'm really rooting for is the female dwarf, Mayomin, whose father is on trial for his part in a rebellion. In a cruelty of justice, her entire family is sold into slavery to atone for his crimes. She's a feisty little one and puts up a good fight while on the run from her captors. The author describes this novella as a prologue consisting of discarded scenes from his soon-to-be published part 1 of the Paesian series. It is an usual format and the stories didn't all interconnect, but it is well worth reading for his beautiful descriptive style and fast-paced action scenes. Some of Jae V. Reece's fascinating ideas include: the colourful magic styles, the treeweaver speaking through the trees, the pulsating crystals, Mistborne - flying evil creatures, and the sentient Mother Tree. The most memorable scene for me was of a winged creature running with wings ablaze. I believe this book is suitable for fans of dark fantasy and paranormal books aged over 15 years. With a little polishing, this will be a truly excellent series. I can't wait to see what the author writes next.